Note: Some spoilers may follow… please WATCH THE FILM before treading here. This film represents many things to many people. In one sense RAIN was a way for Maya (and us) to honor the memory of the child she so tragically lost. It was also a long and parallel story of identity, a way for her to rediscover her creative side — her power, in a sense, that deep part of who she is. Although I didn’t know it when we began, I would ultimately share in that journey of rediscovery, rebirth. Tapping into my own (maybe not lost, but definitely rusty) power — as storyteller, filmmaker, and artist. As I hope is clear onscreen, there was a lot of love involved in this project. To a large number of cast and crew, that also meant a great love for the original X-Men comics that inspired us early on. Those pages that somewhere along the line defined us all as mutants, all those years ago. In so many ways, RAIN was really a love letter to the comics. Of course it all started with LifeDeath, and Maya’s favorite image from that book. An image she related to deeply. A broken Ororo, fallen to her lowest — powerless, isolated. Rendered in painstaking beauty by the indomitable Barry Windsor-Smith. This was really the only time I’ve actually wished for a tall IMAX aspect ratio, trying to compose this original portrait shot in a widescreen format. We made it work (including adding some easter eggs in the extra spaces to the left), and it was ultimately lovely (lit so beautifully by director of photography Brandon Torres), even if never quite what the original was. Still, as I spent ridiculous and precious minutes lovingly draping/sculpting/molding wrinkles in the folded sheets over Maya’s posed body, I wondered if everyone else on-set appreciated this level of obsessive compulsion. Finally, watching playback on the monitor as Brandon rolled the crane over Maya’s body, settling at last into our recreation of this iconic image, I felt cold chills on my arms as the shot came to life. Even the second and third shots were reminiscent of subsequent panels in the comic. Similar, but different. But inspired by such emotional panels of such a brilliant issue of the X-Men, we felt honored to tread even lightly in those footsteps. While our dystopia is an original story, the MNI-controlled world we paint does harken back to a Senator Kelly-inspired “Days of Future Past” sort of timeline. So we felt it appropriate to add some nods and flourishes accordingly. 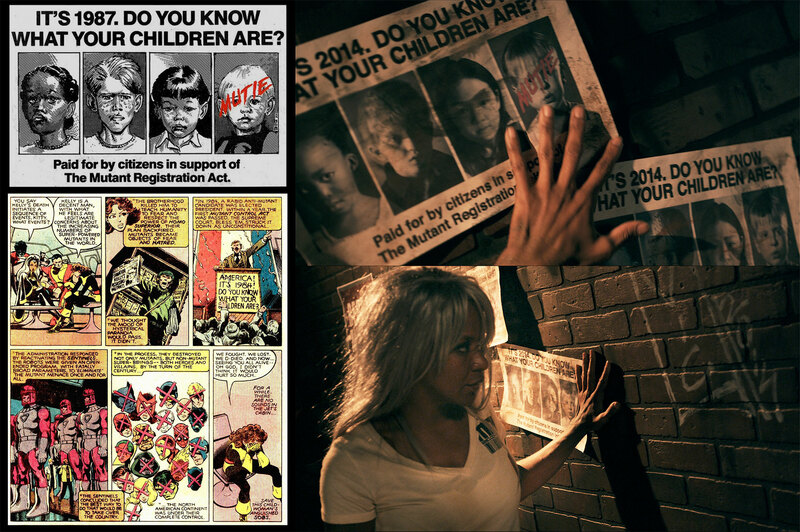 Of course, the “ATTENTION: YOU HAVE ENTERED (ARE LEAVING) A CONTROLLED ZONE” posters were a direct nod to comic panels from those amazing Byrne/Austin illustrated pages. 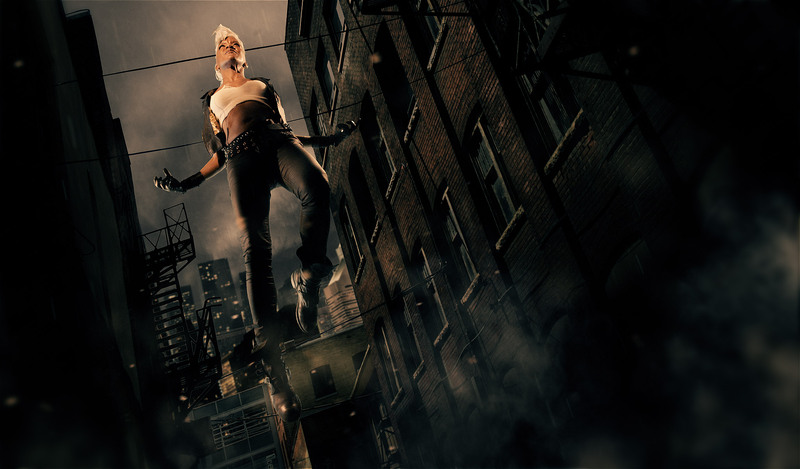 But we also decided to go more overt with the composition at the end of one alley early in the film. 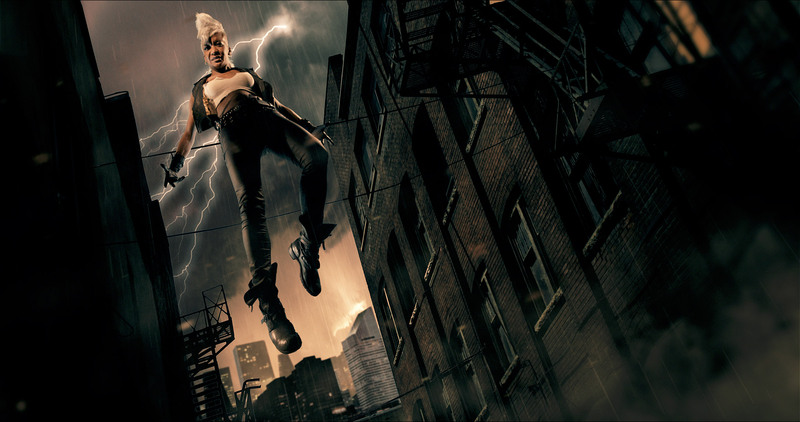 Although it is Ororo and not Kitty Pryde in jeopardy here, we did choose several poses accordingly. And while she is not being defended by an aged Logan/Wolverine, there are shades of him in both the background, and the actions that play out here. In our color-correction, we almost lost the details that suggest someone else may have walked through this same alleyway some time before our story, but if you freeze-frame this sequence just right, you might catch the slashed sign to the left — very close to where Wolverine was originally posed in the classic cover. We also repurposed the awesome promotion Marvel used back in 1987 for their “Fall of the Mutants” cross-over issues, spanning stories that foreshadowed the dystopian future of “Days of Future Past.” In this case, we probably should have pushed the date a couple of years further out than 2014, but none of us honestly expected this project to take so long! 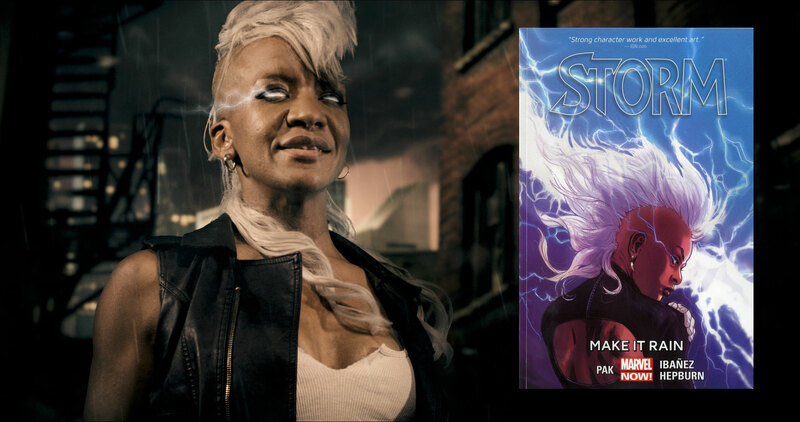 Of course we also mirrored the stance — and line — of the original first appearance of Storm in mohawked form. (Uncanny X-Men #173, October 1983.) “My apologies for being late” seemed to be a necessary first line for her new look. Hopefully Chris Claremont would agree. Thanks to a Facebook friendship between Victor Ibáñez and Maya, we were actually able to secure his permission to include his “tag” in our short film. We are hopeful the other artists similarly honored in our film are as gracious about our unauthorized tributes! Thank you to each of these writers and artists — for the many, many hours you gave us, poring in fine detail over your work, dreaming of mutant worlds needing saving.